Hurricane Harvey’s path of destruction has left hundreds of thousands of Texans without power, and the state’s utilities are facing days, or even weeks, before the floodwaters recede and they can begin to repair the damage. As of Monday afternoon, about 290,000 customers were without power in the southeastern parts of Texas, as the hurricane that ripped into the coast on Saturday lingered on as a rain-dumping tropical storm for its third day. The outage numbers are bit lower than the 300,000-plus without power as of Sunday afternoon, but just barely, according to Department of Energy storm updates. In the south Gulf Coast, utility AEP is predicting that it could take until midnight on Wednesday to bring power back to 95 percent of its Corpus Christi and Sinton area customers. The rest of its territory isn’t expected to come back on-line until Saturday, and it isn’t even venturing a guess for the coastal cities of Rockport, Port Aransas, Fulton, Woodsboro, Port Lavaca, Lamar and Bayside, where the storm’s damage was most severe. The utility has 2,000 of its personnel working, and they have been joined by 3,000 more from outside the area. CenterPoint has invested hundreds of millions of dollars in a smart meter network that was keeping it up to date on which customers were without power, according to its Twitter feed, which implored customers that there was “no need to call us about power outages. Smart meters tell us.” But those meters can’t help the utility restore power to flooded city blocks and building basements. It has also invested in a fault location, isolation and service restoration (FLISR) system, using a combination of automated and operator-controlled switches on its distribution circuits to reroute power to more customers more quickly after an outage. 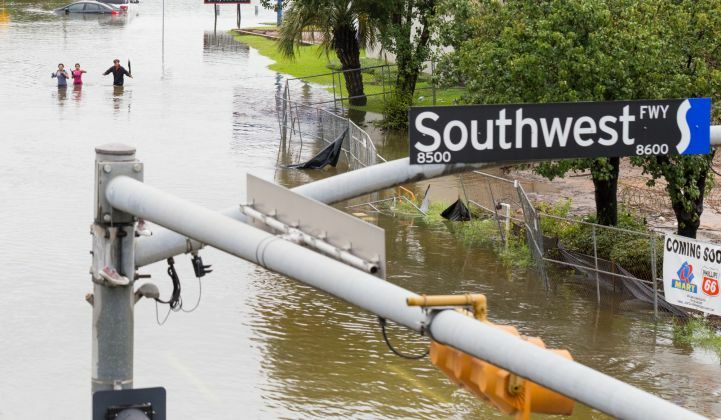 But the kind of flooding that Houston is experiencing is a disaster of a far greater magnitude than the kind of short-term outages that FLISR is best suited to handle. Even once crews can access once-flooded substations, they’ll need to wait for equipment to dry out and inspect it for damage before re-energizing it, DOE noted -- a checklist also required of any flooded home or building that wants to turn the power back on. 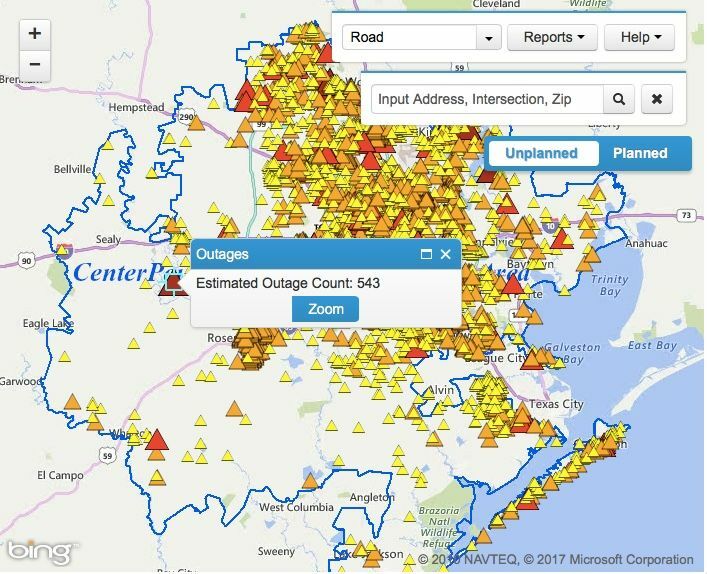 Indeed, DOE reported Monday that Entergy Texas wasn’t able to access some of its electrical facilities due to debris and flooding, which was expected to slow restoration for the 7,600 or so customers without power in cities including Beaumont, Dayton, Winnie, Navasota and Cleveland. CenterPoint also has a fairly large share of underground distribution circuits, nearly 24,000 miles compared to 28,700 miles of aboveground, pole-mounted circuits, Kellison added. While underground circuits are more resilient against hurricane winds, they’re very susceptible to flooding -- and while a handful of key circuits may be equipped with waterproof or weather-resistant gear, most aren’t. While the flooded parts of Texas struggled with a long-range plan to restore power to customers, the state’s transmission and generation system was holding up well as of Monday. State grid operator ERCOT reported that it continued to see widespread transmission outages near the southern Texas cities of Corpus Christi and Victoria. But it was reporting a stable and ample supply of generation to cover its statewide needs, with a margin of 4,639 megawatts as of mid-afternoon Monday. 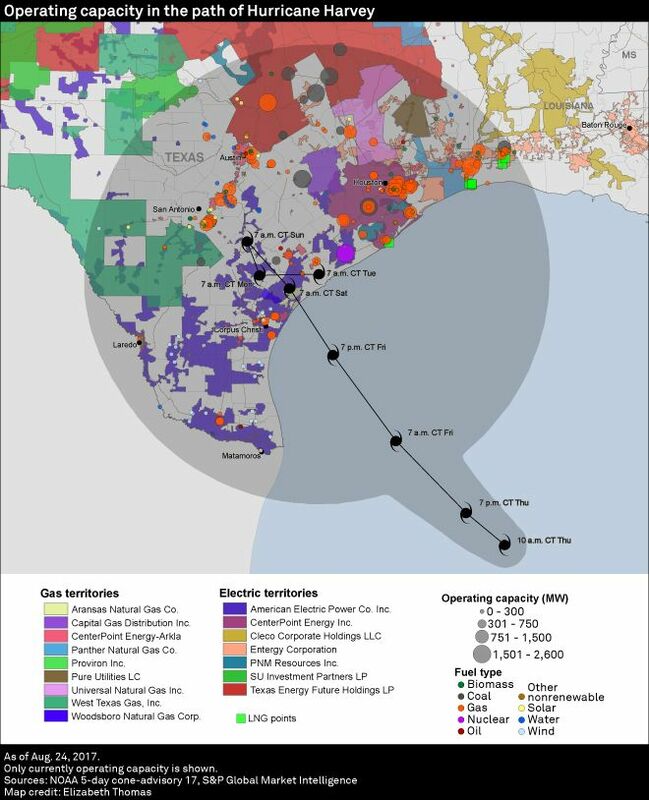 That’s a relief, considering that nearly 68,000 megawatts of generation capacity was within Harvey’s path, according to this S&P Global Market Intelligence analysis. Harvey has also forced the closure of about a quarter of the Gulf of Mexico’s offshore oil and natural-gas platforms and much of the state’s south coast refinery fleet. The threat of extreme weather is becoming an increasingly important calculation for energy markets. Join us for the U.S. Power & Renewables 2017 conference in Austin, Texas this November to meet with top regulators, utility executives and technology leaders dealing with the aftermath of Harvey, and applying its lessons to the nation as a whole. The two-day conference will include the solar expertise of GTM Research, the wind energy analysis of MAKE, and the broader energy and utilities expertise of Wood Mackenzie.